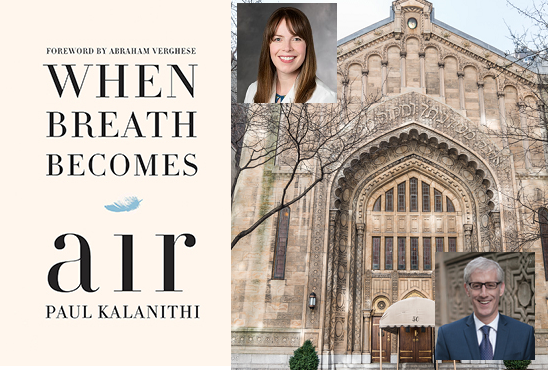 Be part of another highly anticipated evening with Dr. Lucy Kalanithi, widow of Dr. Paul Kalanithi, New York Times best-selling author of “When Breathe Becomes Air”. Like that profoundly moving evening in April, when the JCC hosted a conversation between Dr. Lucy Kalanithi, and Rabbi Mychal Springer, Director of The Center for Pastoral Education at The Jewish Theological Seminary; this event promises the same and will be presented at Park Avenue Synagogue, with Rabbi Neil Zuckerman having a conversation with Dr. Lucy Kalanithi. When Breath Becomes Air, is an intimate and stirring look at how Dr. Paul Kalanithi dealt with his stage IV lung cancer diagnosis. Dr. Lucy Kalanithi, MD, FACP, an internal medicine physician and faculty member at the Stanford School of Medicine and author of the book’s captivating epilogue, will share her husband’s story and the journey her life has taken since the memoirs release. This event is sponsored by “What Matters: Caring Conversations about End of Life”, Central Synagogue and Park Avenue Synagogue. A special thank you to Howard Sharfstein, a Central Synagogue congregant and their former President, and current board member of Plaza Jewish Community Chapel for his generous contribution. “What Matters” is made possible by founder, funder, and partner, Plaza Jewish Community Chapel, Inc., and support from UJA-Federation of New York, and is a collaboration between JCC Manhattan, the Center for Pastoral Education at JTS, and The New Jewish Home. Click here to register for this event now. Limited seating available!